I want to share my knowledge of this renko scalping system and donchian power which i’ve get from forex forum. And I have already proved and very worth it. 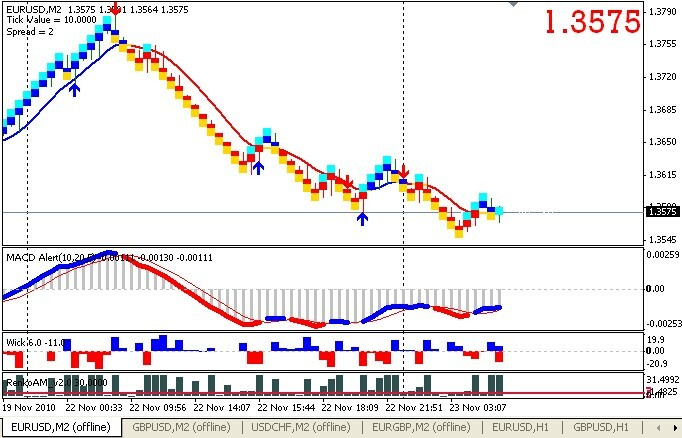 So for all of you if want to make consistent profit from forex market use this scalping system because is very simple and accurate. Since I use this indicator donchian and Renko Chart is my profits continue. Because these indicators are not the usual indicators. And this indicator is never too late in giving the signal, and the reply signal is only accurate at the hour london and usa session because at asia session so many frequent false signals. Do not use Donchian to the OP!! Never Trade on Asia Session or side ways market because there’s so many false signal so only trade on LONDON and USA SESSION ONLY. If successful then its Renko’s Chart looks like picture above. According to Wiki om, Donchian line formed by attracting the highest price and lowest price in units of time that we specify. This simple phenomenon proved to be very powerful for decades. That’s why I started this analysis by observing the trading day this individual. Note the picture above, where if prices break through the highest point Donchian, then prices will tend to rise steadily for several hours. Also down was the same time. Okay now there is kind of nice to be noticed. , Band Donchian middle line us? And how prices are affected by it? Yup true … is “not aware”, Donchian middle line also serves as the line “Support / Resistance” dynamic …. awesome right … Why how come? Note that when moving from the highest point, the price will move to the center line of this first. At this time, the center line to the point of resistance. Often the price will bounce back up. If successfully passed the center line, then prices will tend to catch up to your bottom line Donchian. Pay attention and observe. If you usually do when we open the MT4 then the price will appear as Candlestick (CS) or Bar Chart (BC). Each stem represents the price movement in one time unit. For example we use the H1 TF 1 bar contains pricing information OHLC (Open – High – Low – Close) in 1 hour. Or at TF W1 (weekly), then 1 bar contains information OHLC prices within a week. The new bar is formed when a period of 1 hour (at TF H1) has been exceeded; on the TFs W1, a new bar is formed when a period of 1 week was exceeded. That is why we often see a bar whose length is different, because at this price movement must be different from the price movement at the other. Well if not guided by Renko Chart at the time. That is: the time has no effect on the formation of a new bar. So who determines what the formation of the new bar? Only one factor: PRICE.For example a bar Renko is set at 10; means every 10 pips price action it will form a new bar. Let’s say within 10 minutes the price moves from 1.9000 to 1.9030, meaning there is movement of 30 pips ya, it will form three bars each of length 10 pips (or 10 ticks). In CS and BC at TF H1 (1 hour) this movement is not necessarily “recorded” as a new bar, as it still occurs in the same unit time. 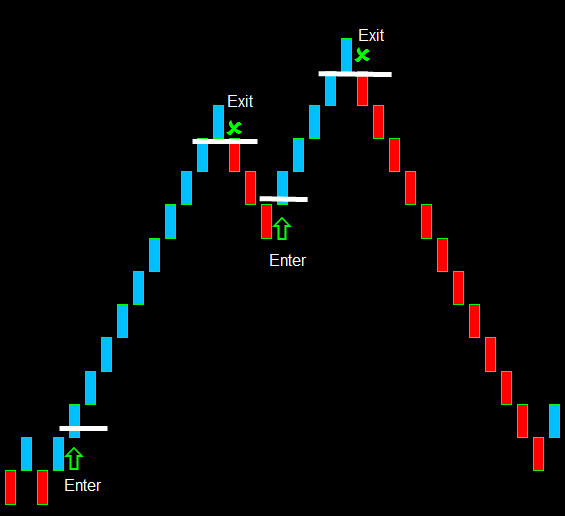 So with Renko charts we can more quickly see where the price moves. Trading only in the active hours, open session Europe (Frankfurt) , and the British open. If you want more active is when the overlap between the European session and U.S. session, and can often continue until the closing session of the United States. This Donchian only for filter, if trend up so only buy never sell because , if trend sell so only sell never buy , we use donchian on H1, example if donchian h1 said only buy so we trade only buy on m2 tf from renko chart, so renko chart and donchian have to be the same signal before we take action to trade. 5. Make sure Donchian H1 is UP TREND than enter a Buy and place the stoploss on middle line from donchian bands from h1 time frame. 6. Make sure renko AM v.20 is break level 3. 5. Make sure Donchian H1 is DOWN TREND than enter a Sell and place the stop loss on middle line from donchian bands from h1 time frame. Donchian is a very powerful trading tool! This was so powerful to the extent that a trend reversal can be seen clearly. What I need to emphasize here is the words “usually” in the picture above. My observations so far have I pour there, but surely there will be times when the opposite occurs. 1. If the price of “playing around” in the middle line Donchian too long, it was a sign prices are not strong enough to penetrate / her journey. Which can be concluded: the current trend will continue. 2. 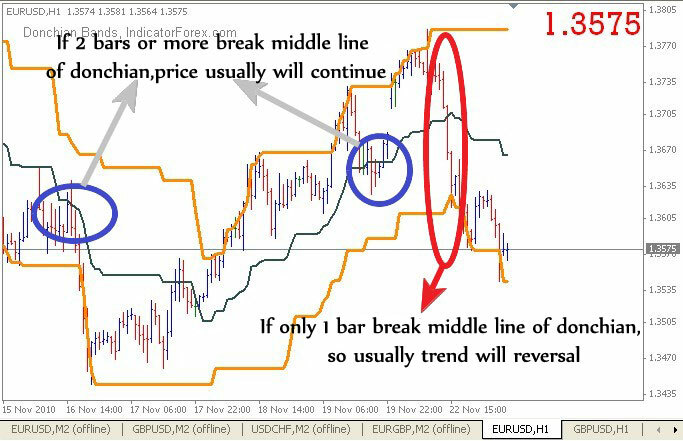 If price is not playing around in the middle line of Donchian, but immediately cut off with a bar alone, meaning trend has full power to continue the journey. Which can be concluded: the trend will change. Chart 1 only filled the EA only, and is not required for analysis. So this chart settings just once, and already it can be forgotten (but not closed, because of the Renko chart is a bar to get “data” to form a bar by bar. Chart 2 and 3 which will often we monitor to analyze and execute the analysis results. 3 chart is needed for a pair. So if we want to analyze two pair means the MT4 chart 6 we will open it. This strategy can be used for 14 pairs, because this system is using average form from multiple time frames so give us best price action signal. But my experienced using on GBPUSD, EURUSD,AUDJPY and USDCHF is the best. 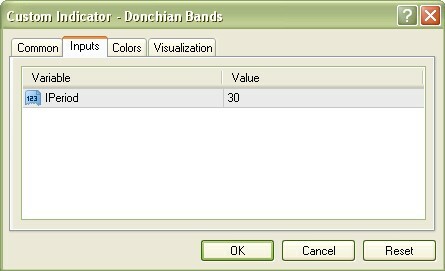 Donchian bands as a scalping indicators works very good on four hour time frame or at least on one hour time frame for intraday traders. Download and manual installing from this great combination renko donchian HERE . 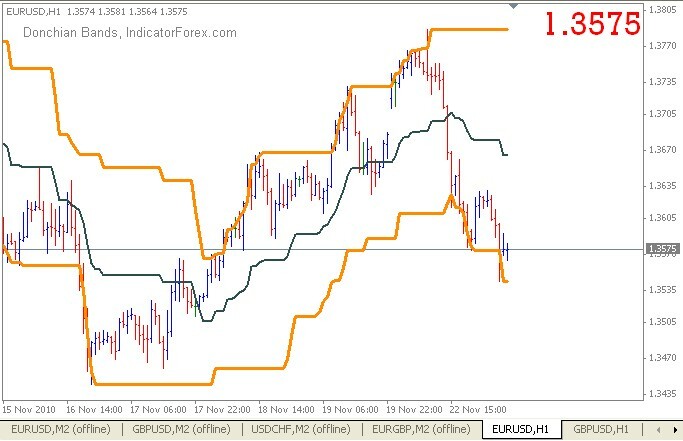 This simple scalping strategies is very useful but still wise with your money management and don’t forget using a good forex broker for scalping too.